Curious to know what your baby might look like if it was born in a horrifying alternate reality? Look no further. Mash-up photographs are a pretty easy hit these days. The internet was quickly inundated with face swap photos shortly after Snapchat released their face swap filter, and that came countless years after web users had already taken to swapping their own faces with the likes of dogs, babies, alpacas, you name it, all in the name of earning quick laughs. With that hype in mind, it's no real stretch to imagine app developers blending together two adult human faces in order to roughly approximate the appearance of the two's potential offspring. It's a lighthearted, fun sort of idea; however, for the app Make A Baby Booth, the results lean away from the light and fun and more toward the fuel of nightmares. Such was discovered by the likes of Tiffany Holloway and her boyfriend Darius Moore, who used the app to see what the fruit of their union might look like. The result, it's safe to say, was not what they expected. The results only get worse from there, with photos like this one from Twitter user Elina Pahnke proving how badly-suited the app is to creating silly, entertaining photographs — to say nothing of the idea of any reasonable prediction of a baby's appearance. 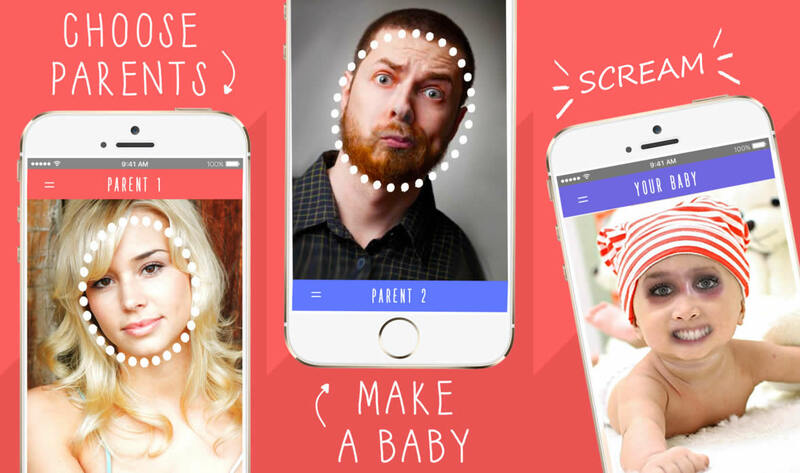 No, it seems Make A Baby Booth provides its users not with a joyous look at future offspring, but a 99 cent glimpse into their worst nightmares, and a thoughtfully-compelling reason to reconsider abstinence.